If you've ever rented an apartment in New Delhi, you know how landlords can be. If you're a single man, they try to scope you out for their daughters/nieces/granddaughters. They think it’s their right to know your life story over a plateful of chicken. They don't feel a thing asking you details about yourself that you would think twice before sharing with a friend: So many years married, why no children? Some problem or what? How much salary you make? The husband says it’s my snooty, South Mumbai upbringing—that I just can't appreciate Indian hospitality or the Indian way. After marriage, caught between the friendly neighbours and a prickly Mumbai wife who's allergic to questions, his relationships with his landlords went rapidly downhill. Overall, New Delhi is always one of those cities that can rub you the wrong way if you’re an outsider who needs to stop over for a couple of days. Especially in the overbooked India, where a plush hotel room can easily cost Rs15,000 a night. Even once mid-range hotels like The Claridges, Aurangzeb Road, are always full and highly overpriced. So what’s the option then? Say the word guest house and one visualizes grimy spaces, nosy landlords, women-unfriendly apartments staffed by men who have been known to peer through peepholes (this actually happened to a friend earlier this year). Make that five, all quite different from your cookie-cutter five-star (see Page12). Bright cheerful rooms, a luxurious Lutyens bungalow, a place that wants no publicity, a 10-room luxury boutique hotel and a room with a view. Of course, in a couple of these places, conversation with the landlord might be in order. 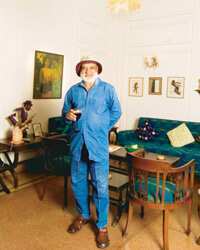 But then if your host is Baljit Mallik, poet, jazz aficionado, world traveller and ecologist, you’re likely to be the one asking the questions. This week, we were feeling so magnanimous, we decided to give you two cover stories for the price of one. Turn to Page14 to find out what everyone in the art world is talking about. Collector Harsh Goenka believes that right now, all good art in India is happening in Baroda. If you’re serious about your art, a trip there might be overdue. Or maybe not—graduates from the Baroda school of art are everywhere—in the two auctions that were held yesterday, in shows in your neighbourhood and abroad. So what are you waiting for? Take out the chequebook. How much did you say you earn?